In #hijrahseries2, we seek Purpose and Acceptance. How do we love Allah? How do we accept Allah's Love? you've been walking around with a heavy heart. your heart has been feeling restless and uneasy. you seek Divine Love and Fulfillment. Begin your Hijrah with exploring your foundation - your heart. 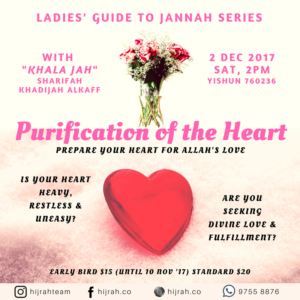 "Khalah Jah"- She is Sharifah Khadijah Alkaff, a teacher, counselor, translator, writer and motivational speaker with so many experiences in the field. A single mother of 3 sons - 2 with special needs, she continuously tries her best to seek and share knowledge by writing booklets on topics such as Tawakkul, patience, challenges of working muslimahs, importance of family and many more. In 2009, Khalah Jah was awarded the Singapore Exemplary Mother of the Year Award and in 2014, received the Brunei Darussalam Excellent Teacher Award from the Sultan of Brunei Darussalam. 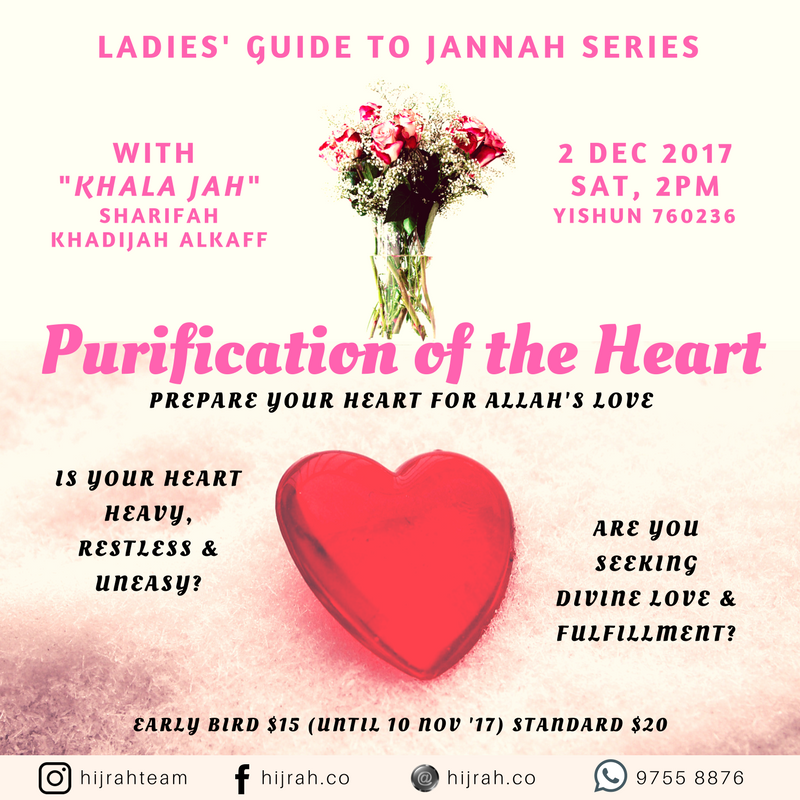 Khala Jah will be here to have an intimate motivational session, while sharing her experiences, to help you find peace, purpose and acceptance.